Research over the past 25 years has increasingly demonstrated the importance of the social determinants of health, encapsulated by social and economic health factors. This measure is a combination of community safety, education, employment, income, and family and social support. In addition to their strong connections to health behaviors and access to care, social and economic factors affect stress levels which have a strong bearing on mental and physical health. The social and economic factors measure is created by standardizing several components and then weighting them based on their importance. 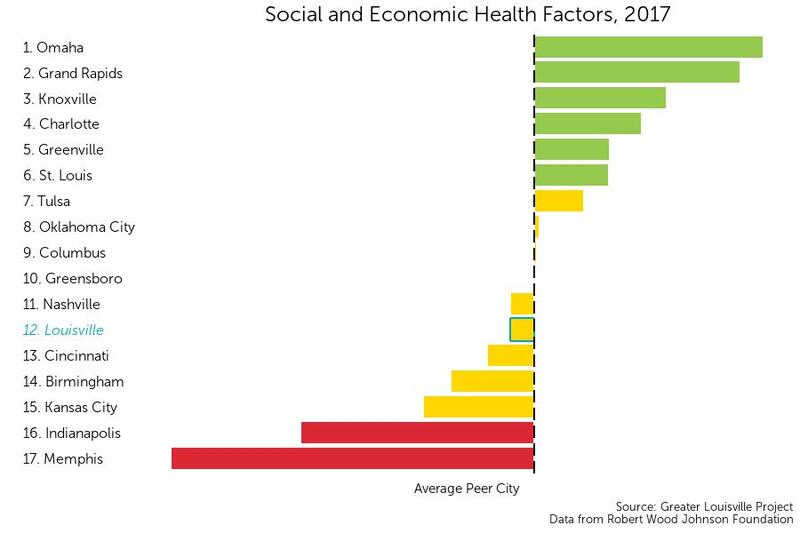 Louisville ranks 12th in terms of socioeconomic and health factors, ranking below the peer city average. This graph shows an index of health behaviors where the vertical black line represents this average. The bars represent how many standard deviations from average each city is.